Title:"The Mind Reading Chook" and "The Lost Voice of the Grand Final"
Available from distributor Port Campbell Press. In Book 2, The Lost Voice of the Grand Final, Astrid has to find the Voice of the Coach in time for the Saturday Grand Final. Was the Voice captured in the TV 'Footy' studio? Lost down his throat? Was a Voice Coach any use? What about the Speakeasy? or the Voice-over on the TV Footy panel or on Talk-back? And then there's the Bird Wedding of the Year. Carrot was supposed to be the MC (Master of Ceremonies) As usual, Sleuth Astrid the Mind-Reading Chook, solves the problem. 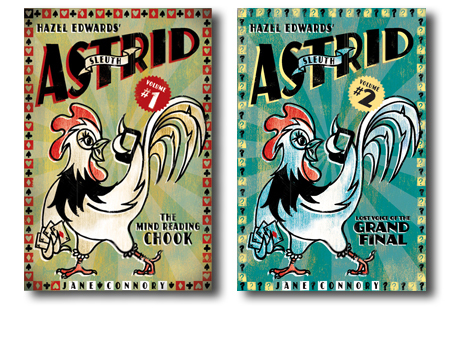 Classroom performance script sleuth_astrid.pdf: Useful activity based on the book. Flexible cast. Fun. Aust_Crime_Review .pdf The language is direct and very readable. Quirky and clever. 'I found 'The Lost Voice of the Grand Final' very intriguing.